This is a wonderful and enormous exhibition. Each room could be an exhibition in itself. It is a chance to see your favourite artists tackling the universe of the garden - Bonnard, Monet, Pissarro, Matisse, John Singer Sargent. It’s also a chance to make some new acquaintances, like for me, Santiago Rusinol and Joaquin Mir y Trinxet. The show is so big I’m just looking here at three show-stoppers and a group of three paintings at the end. This is a painting of early spring. Perhaps it’s the first warm day at this allotment with a blue pearly sky. There are five figures spread out across the picture, quietly engaged in their tasks. The brand new spring sunlight reveals colours that seem bleached. This is before the full force of spring has arrived. You can almost imagine some snatches of overheard conversation coming across the garden. The interpenetration of the sprawling, understated houses with trees and greenery shows a perfect balance between man and nature. The eye is most discerning about colour in the yellow-green part of the spectrum. These bleached colours are pale yellow pea-greens of cabbages in the foreground, and blue-greens of closely packed leeks. The distant poplars have a glaze of green promising leafy foliage to come. The branches of the apple trees in the middle distance have a green-brown hinting at new growth. I love this painting because it conveys such a quiet, productive scene where people and their surroundings are in peaceful harmony. I love the way the soft, spring light reveals the first signs of spring’s growth. 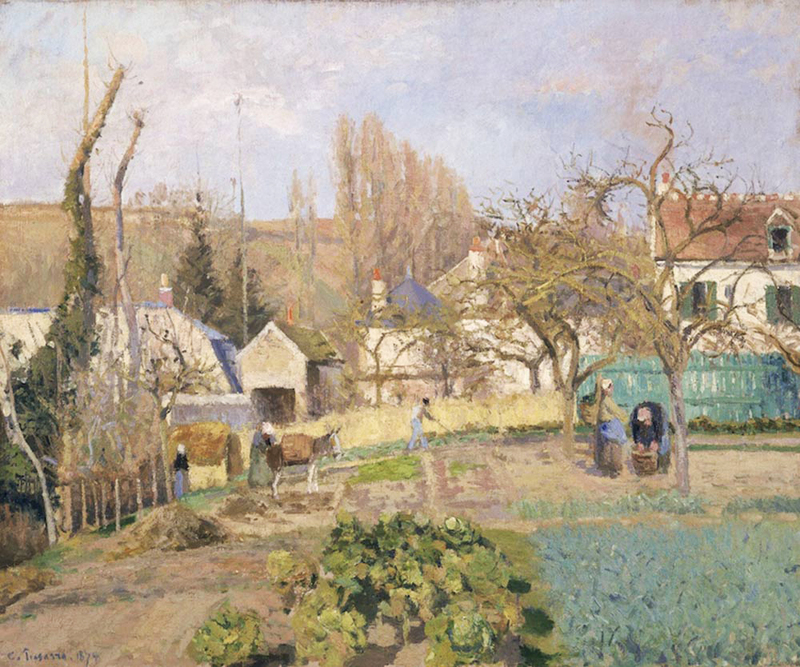 Pissarro is so brave, punching out the shapes of the cabbages’ shadows in the foreground, that march you into the picture. 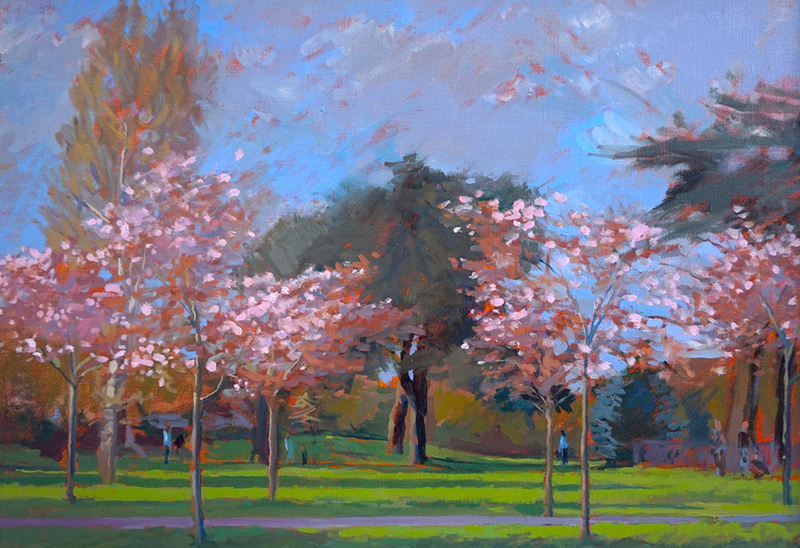 Paintings such as this have encouraged me to love the earliest stages of spring the most – when everything is potential. 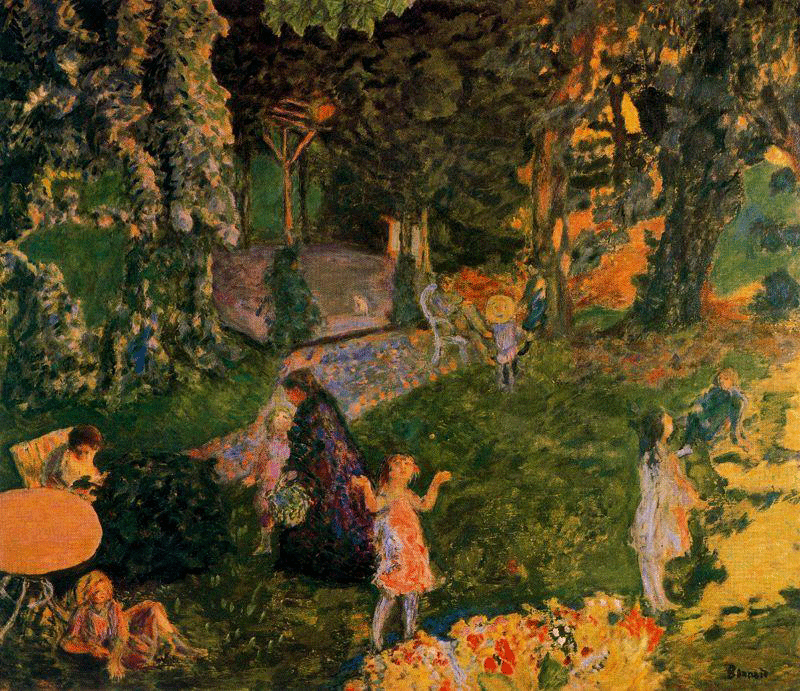 ‘The Family in the Garden’ by Pierre Bonnard. ‘The Family in the Garden’ is a painting of a summer’s evening in a park-like place. It is filled with children and parents and the voices in the painting are almost audible too. You can sense the lingering heat. This painting is a reminder of happy, summer days with children still at their parents’ side. Did Bonnard paint this picture to remind us of the importance of these magical summer evenings and how precious they are? The disposition of yellows and reds amongst all the different greens is a peace of artistic wizardry. He makes such inventive brush marks. What are the yellows and reds? They are plants, and patches of sunlight, set in a slightly shadowy garden, suggesting the warmth at the end of the day. The different realms of shadowy greens and illumination are cunningly linked by a diamond shape at the centre of the picture, which is carefully balanced with blue-purples against yellows and pinks. This is a pathway – a diamante pathway- that has turned into another most brilliant bit of picture-making, linking the figures in the foreground with those of the background. There’s just enough dusk for Bonnard to be able to hint at the mystery and wonder of the late summer evening’s hour. This painting describes ordinary play in a way that suggests both mystery and reverie. 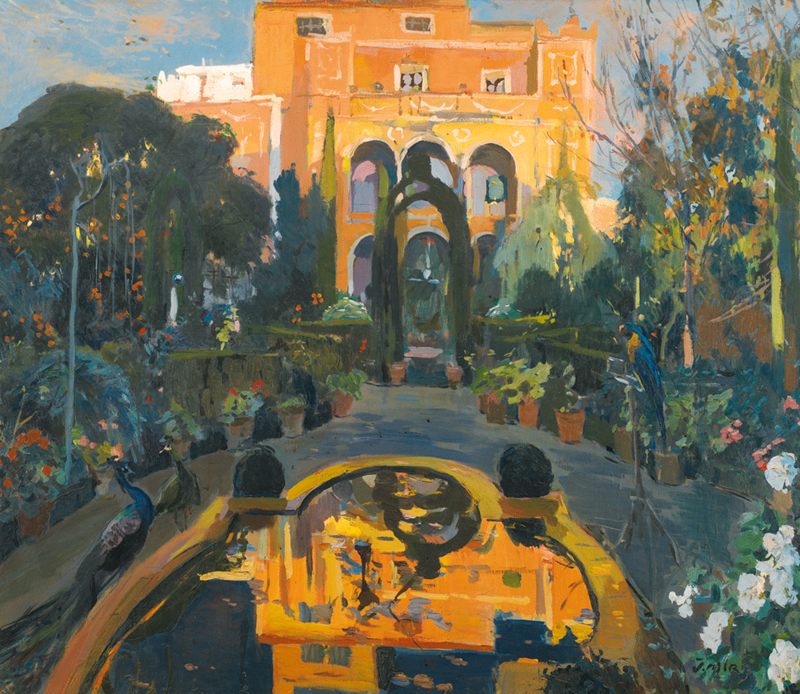 What about the sheer gorgeous splendour of Joaquin Mir y Trixit’s ‘The Artist’s Garden’, where brilliant orange, late-evening light hits a building and is reflected powerfully in the foreground on an ornamental pool. To convey the brilliance of this blaze of sunlight just before the day’s end, the artist has plunged the rest of the garden into multiple deep shades of green, and it all works. This is the triumphal moment of a powerful summer’s day. The shadowy areas are pricked out with red blooms and twinkling lights coming through the trees. There’s an intricate balance of light and shade in the top right hand corner. This must have been a fiendishly difficult painting to produce at this scale, because this last burst of rich sunlit colours would only last for seconds to capture each evening. Unusually we’re seeing the sunset by looking east at what it’s hitting. We are seeing the sunset reflected back in the baked walls of the building at the back of the painting and into the pool in the foreground. No review of this exhibition can miss out describing the extraordinary coming together of three enormous water lily paintings of Monet, brought together for the first time since they were created, nearly 100 years ago. What incredible stamina it took to create these paintings, which rival nature itself in their scale and intensity, done when the artist was aged 75-85 years old. So much happens at once. We loose our earth-bound sense of the surface of the water. We only sense it with the water lilies conveyed by dashes of pure colour not tied to any colours that the eye might have seen but by colours that might be remembered. We see the vastness of the sky, brought here below in the reflections. For me these paintings say there is heaven on earth, if we can only see it. Each visitor will have their own interpretation and that is all the more worth doing.  Save enough strength to linger in this last room. Or better still, make another visit. Over the bank holiday weekend, I found a book on Churchill in my husband’s study. It got me thinking. Churchill was a patient of my neurologist grand-father, Foster Kennedy in 1932 when Churchill was knocked over by a car in a New York street. My grand-father was famous for his meticulous clinical examinations. In the days before brain-scans, my grand-father was able to say that although Churchill had broken ribs, he had no brain damage. Churchill was sent to Florida to recover. But word got back to Belle Vue Hospital where my grand-father was working that Churchill was depressed. Otto Pickhart, my grand-father’s boss, sent my grand father down to Florida to see what was happening. Just after 8 am on a Friday morning, my grand-father picked up Churchill’s notes and saw that his boss had taken Churchill off all alcohol. “Let him drink what he likes,” he said. And within 20 minutes, after champagne and I think brandy, Churchill felt much better! My grand father and Churchill got on well. Mostly that weekend they talked about the rising menace of the Nazis, a message that Churchill was going to give in a series of lectures in America that had, of course, all been cancelled. Fast forward to the Winter of 1941/1942 -after the Battle of Britain and pre-Pearl Harbour-when my mother remembers my grandfather coming down for breakfast one morning. He said, “You remember the Prime Minister of Great Britain who we hear on the crackling radio News Bulletins… I got a phone call at 3am last night. “Is that you Dr Kennedy?” a female voice on the other side had said. I replied, “It is”. Then a gruff male voice said, “If America joins the war, will the Union hold?” I collected myself and said that on the whole I thought it would. That was the end of the phone conversation." My grandfather then turned to my mother, aged about 15, and said, “I hope I gave the right answer!” I like to think that it shows that perhaps Churchill took soundings from people who’s judgement he respected. Possibly my grandfather was one of those. My grandfather has a claim to fame with the Foster Kennedy Syndrome. During the course of all his clinical investigations, my grandfather discovered a condition in the eye in the retina that can be seen easily by an optician. This abnormality in the eye predicts the location of an abscess in a particular region of the brain. Left untreated, this would cause paralysis in the patient’s legs leaving them unable to walk. I like to think that my grandfather has achieved a sort of living immortality. Opticians, daily, and around the world, look out for the abnormality in the eye that my grandfather spotted. They are alerted when they see these symptoms and can send people straight to hospital for an operation that can save their mobility. Watch out over the next couple of days for this moment of hesitation before the full arrival of spring. At this very moment of early spring most of the leaves on the trees are tiny and brand new and you can still see through them to the sky beyond when you look up. Millions of tiny leaves are decked out about the branches of the trees and they all look as if they have been stilled in mid air. All the tiny leaves look like a stilled explosion. This isn’t going to last long. It is like a hesitation. It only lasts 2 or 3 days! All the leaves are growing so fast each day that in a day or two we will have the full-blown arrival of Spring. Then, when that comes, any day now, and you look up again at the trees, the sky will be obscured by all the magnificent new foliage. Magnificent, explosive, fabulous and wonderful – real May. But don’t miss this special moment of stillness amidst massive change- a hesitation in the arrival of spring that looks like a stilled explosion or a very slow motion explosion that suddenly speeds up. 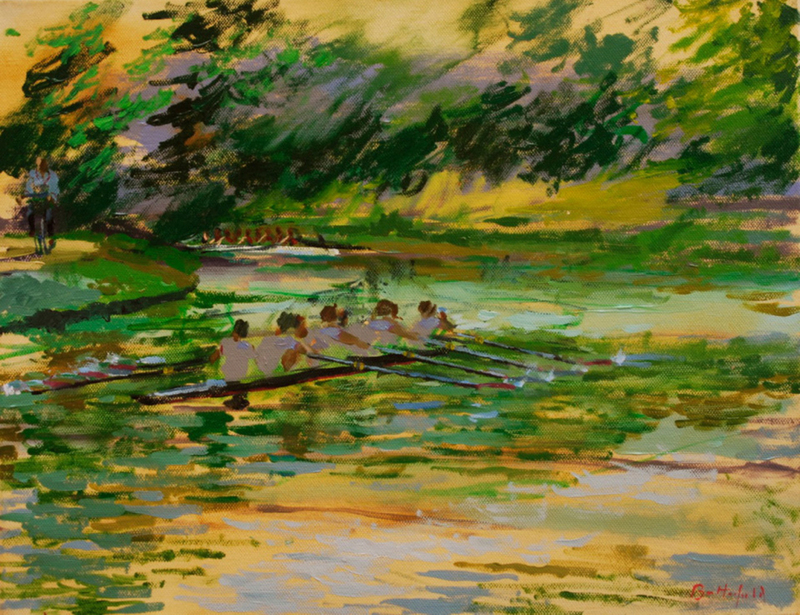 Downing College Alumni asked me to paint a picture of a Downing College rowing 8 to get the exact moment of the oars dipping in the water, I shot down early one morning to Strand on the Green to photograph the rowers at the right angle and just at that moment in time. I also went to Fen Ditton in Cambridge and did some paintings in oils on boards to capture the colours of the river and the sky. I was asked to imagine the scene on a summers evening during the May Bumps, where, because the river’s narrow, the boats race to catch each other up. I’ve been busy this week getting my original Downing College Rowing painting down to Snappy Snaps in Chiswick and colour matching their prints to my painting. 49 are being made and sold at £500 each to raise funds for the Butterfield-Everett Scholarship Fund which is to fund a post-graduate scientist. The figure on the bicycle could be the current Master of Downing College or my dad, John Butterfield who was Master in the 80s. Since 2010 I’ve been making colourful evening dresses, that are linked to the paintings. At one of my recent exhibitions, ‘Above the Horizon’ at Frost & Reed, dresses were worn by a lovely team of young actresses. We had a lot of fun and it was like the paintings coming to life … which I spend most of my time trying to do anyway. I get a lot of my ideas for dresses and paintings from impressions of India I get from visiting Southall – I’m obsessed with the colours and galactical sparkliness! I wonder if the reason we are drawn to starlight, jewellery and light on water is because it makes us think about the origins of life. If Tintoretto designed a line of jewellery what would it be like … ?